It's a fact that exercise releases endorphins, the body's own happy pill. So why not get some exercise for positive vibes that will last all day? 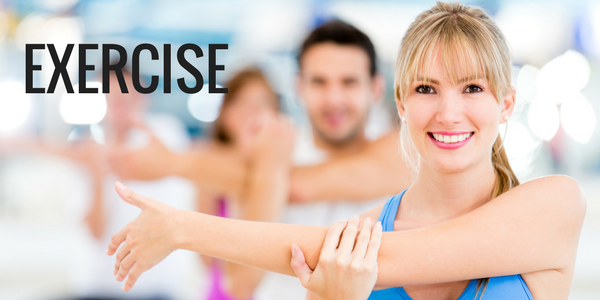 Exercise has been shown to reduce stress and anxiety, improve sleep, and boost self-esteem. Beat the Winter Blues says walking, jogging, low impact aerobics, yoga, swimming, and tennis are effective mood-improving exercises. Women's Health recommends 35 minutes of walking 5 times per week to reap the happiness benefits. Be sure to check with your doctor before making exercise changes. Get some sunshine! Boosting your vitamin D shows a direct correlation with a boosted mood. Read more. Even an hour a day of natural bright indoor light has been shown to have a positive effect. Bring the outside in! Surrounding yourself with greenery during gloomy days is a very good way to perk up your spirits. House plants provide oxygen and cleanse the air. Not only that, plants are visually pleasing. If you have them in your home and workplace, they can help create a very calming environment. Finding the ideal houseplant is easy. Caring for house plants is very rewarding as well. This activity has been shown lower blood pressure and stress levels. What plants are good for indoors? Here's 7 houseplants for low light conditions. This time of year make some mood adjusting changes to your diet. It's important to eat healthy, well-rounded meals. Limit excess sugar and processed foods. Prevention Magazine recommends stocking up on plenty of salmon, leafy greens, whole grains, bananas, nuts, and even kefir. Be sure to check with your doctor before making any dietary changes. Indulge a little, too! Did you know chocolate can improve your mood? According to Psychology Today, the flavanols in dark chocolate help to reduce blood pressure, boost mood, and improve memory. General rule of thumb, look for chocolate with at least 85% cocoa. Crank up the tunes! Listening to upbeat music can make you happy. In a study by the Journal of Positive Psychology, they found that listening to upbeat music improved mood in as little as two weeks. Need some inspiration? Here's 65 happy songsto get you started. Dive in to some hobbies! Whether you're into outdoor sports such as skiing or ice skating...or you prefer to indulge in indoor hobbies such as knitting, scrapbooking, cooking, painting, journaling, or playing an instrument - spend time on something you are really passionate about. Hobbies are a great diversion from everyday stresses and a good way to occupy your mind. Need some ideas on choosing a hobby? How to Choose a Hobby. Is it possible that just changing your mindset can improve your mood? In a recent article for The Conversation, author Kari Leibowitz went to a Tromsø, small Norwegian village 200 miles north of the Arctic Circle. They experience two months of Polar Night every year, when the sun doesn't rise above the horizon. What was surprising, Leibowitz found, was that the residents were looking forward to the time. Many were excited about ski season and others enjoy the coziness provided by the winter months. To take things a step further, Leibowitz developed a “Wintertime Mindset Scale” to measure how residents of Tromsø view the winter. The Wintertime Mindset Scale asked our survey participants to agree or disagree with items such as “There are many things to enjoy about the winter,” and “I find the winter months dark and depressing.” The results of the study in Norway found that having a positive wintertime mindset was associated with greater life satisfaction, willingness to pursue the challenges that lead to personal growth, and positive emotions. The takeaway, think of all the things that make you happy about winter and focus on those things throughout the season. Need some inspiration? Here's a list of 50 Things to Love about Winter. Spending time helping others may help you even more! Studies have shown that you'll reap the benefits of volunteering. Not only will it boost your mood and provide a sense of satisfaction and gratitude. According to HelpGuide, that's not all it does for you. You may be surprised to know it also helps you connect with others, counteracts stress and anxiety, and builds self confidence. Aren't sure where to start? Here's a list of 10 Good Places to Volunteer. How do you conquer the winter doldrums? I'd love to hear!